Retroperitoneal access for renal surgery in the child increases the challenges of smaller spaces for surgical manipulation, even though it is considered advantageous over transperitoneal methods (14-16). Those advantages are more direct access to the kidney and hilum, less risk of inadvertent injury to adjacent structures, and less chance of postoperative intestinal adhesions. The relative advantage is difficult to define, but the direct access to the renal hilum is a reality that is worth the limitations in space. When space is limited in retroperitoneal access, it is even more important to position ports appropriately and to recognize the limitations in size when working in the smaller space. Maintaining orientation of the camera and the surgical anatomy is essential. A minor rotation in the endoscope may convey a marked apparent difference in the anatomic orientation of some structures including the renal vessels and vena cava. Regular orientation checks are useful, particularly before placing clips on vessels. During any retroperitoneal procedure it is essential to recognize the location of the peritoneum and its reflections. In children this may be difficult as the peritoneum is very delicate and may be difficult to see. Tearing the peritoneum will allow insufflation, which reduces the working space in the retroperitoneum. Often this is only noted as a gradual diminishment in the working space. Typical areas of peritoneal violation are the lateral aspect during development of the retroperitoneal space, particularly if performed with the endoscope, and at the superior pole of the kidney where it is immediately adjacent to the peritoneum. In essence the latter turns the case into a retro- and transperitoneal procedure. There is seldom a reason to convert to an open procedure if the peritoneum is violated. It should be anticipated that certain children would have reduced oxygenation with increased intra-abdominal pressures, including those with restrictive pulmonary conditions, smaller infants or premature infants. Reduced urine output during pneu-moperitoneum is well recognized and occurs in children. 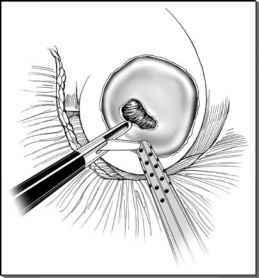 surface surrounding the testis was stripped; yet no substantial adhesions were produced. In most of these cases, as with most transperitoneal renal surgeries, the small and large bowel are manipulated to a minimal degree. It may be that this limited manipulation reduces the degree of adhesive changes. When placed in the context of the facility of renal access, particularly of the ureteropelvic junction, a transperitoneal approach may be preferable. There is early evidence suggesting that the patterns of tissue healing are different with laparoscopic procedures (18) and these may be distinct between adults and children. The mediators of inflammatory changes seem different in degree and timing of activation after laparoscopic surgery than open surgery (19,20). Whether this plays any role in intestinal adhesions remains to be determined.